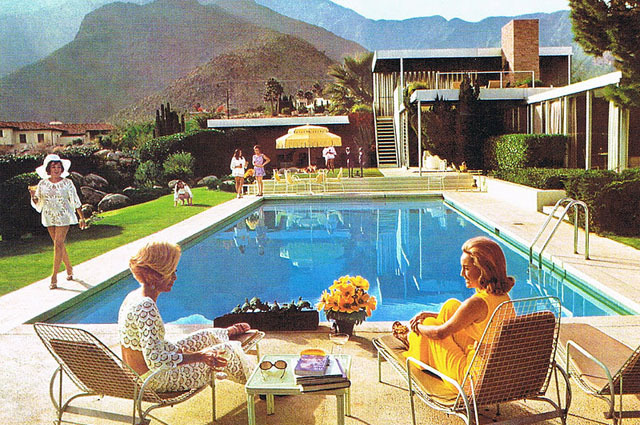 Happy Labor Day with "Poolside Gossip"
What better photo illustration to toast the Labor Day weekend could I possibly find than Slim Aaron's iconic "Poolside Gossip", shot in January 1970 in Palm Springs at a Kaufman house? The whole scene looks so perfectly created that one may wonder if it's an illustration rather than a photo. Not so. From Modernism Week to the blog Kelly Golightly, there are plenty of articles written on the shot. One of the most detailed and fun pieces to read about it appeared in the NY Times in 2015. And while there are – to my knowledge – no Kaufman designs anywhere in South Florida, there are over 550 modernist homes available right now, including a Rufus Nims and several Alfred Browning Parkers. Have a look and enjoy.